In her teens Japanese R&B singer Ellie deeply connected with the music of Mariah Carey. From then, on her own, she made her way to the US. Once there she had the opportunity to study music composition under a top artist often featured on LA’s number 1 radio station power 106fm. Her success didnt stop there. She returned to Japan and officially entered its music scene. in 2008 she experienced increasing popularity on the club scene and in 2010 started performing as the opening act for major Japanese musicians MAYS and MAY J. 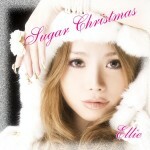 She also released her first single “Sugar Xmas” in Nov 2010, which is available now on iTunes. Check it soon!